When recording exceptionally large structures, sculptural objects, and ones that are not readily accessible, HABS/HAER/HALS uses a high-definition laser scanner. While laser scanning is gaining momentum in the field of heritage recording, scans are only the tip of the iceberg when it comes to creating comprehensive documentation that is useful in efforts such as rehabilitation and historical investigation. Thus, HABS/HAER/HALS supplements the laser scans with hand-measuring, and after the scanning process, uses software to migrate the point clouds into AutoCAD to produce two- (and sometimes three-) dimensional drawings to its standards. This is necessary because the role of the HABS/HAER/HALS drawing is to make the site or structure understandable to the general public, and to interpret the industrial processes, patterns of use, and the cultural values imbedded within. Not only are the measured drawings more easily understood than laser scans, they ensure the long-term permanence of the information. The Library of Congress continues to explore sustainable methods and formats for "born digital" records in order to mitigate the significant back-end costs involved in the storage and frequent upgrading of files, but for now still requires documentation in hard copy. Likewise, scanned data does not meet the Secretary of the Interior's Standards and Guidelines for Architectural and Engineering Documentation requiring that the documentation is reproducible and durable long-term, and that it is clearly and concisely produced. For its laser scanning, HABS/HAER/HALS uses a Leica ScanStation2 due to its versatility. It suits the needs of the programs because of its long range, relatively quick speed, and ability to produce full-dome scans. It also fits easily into the workflow of most projects, which range from architectural monuments and industrial complexes to engineering structures and landscapes. The benefits of the laser scanner include extreme accuracy, a range that can record at difficult to reach heights and locations, and a potential savings in field time. Thus it is indispensable for capturing the measurements of structures that would otherwise require challenging and costly means of access or that are unsafe, and with previously unachievable accuracy. The exactness of the point cloud can reveal the slightest deflection in a wall or, depending on the resolution setting, variations such as cracks and other deficiencies, making it a useful monitoring tool for conservation. 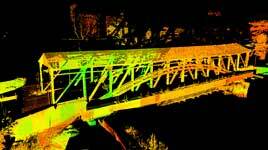 The primary disadvantage of the laser scanner is that it cannot record elements that are obscured by adjacent features, by vegetation, or otherwise beyond the range of its point cloud such as the tops or undersides of structures. Also, because the scanner records by reflectivity, it has great difficulty detecting elements that are dark in color. Likewise it cannot actually "read" building material or discern the subtleties of age and construction technology; these distinctions must be noted by the recorder. The scanner is also generally less effective and time-saving than hand measuring when it comes to recording architectural details and floor plans. Unless special high-density scanners are used, the point cloud image results in an undefined edge that makes it difficult to accurately measure complex molding profiles. To record plans with a laser scanner, each room must be scanned individually, being sure to capture the intervening spaces so that the individual sets of point clouds can be accurately registered. It is, however, effective when measuring plans of large open spaces such as an auditorium. The same is true of measuring smaller sized structures; it takes far more time to set up the equipment and produce the scans in the various locations required to register all elements than to simply measure by hand. The HABS/HAER/HALS programs and the Library of Congress require that the documentation be produced on durable materials to ensure the long-term permanence of the information. This translates to the need for hard copy—such as Mylar, vellum, or archival bond drawing sheets, field notes hand-written on graph paper, large-format photographic negatives, and historical reports on archival bond paper—rather than relying solely on electronic mediums. While promising to save time and money, recording technologies such as digital photography and laser scanning currently lack the permanence and, to a large extent, the quality of traditional mediums used to create HABS records. Concerns about catastrophic loss of files and the back-end costs involved in the frequent transfer or upgrading of electronic files to keep them current and guard against corruption likewise remain a deterrent. The Library of Congress, other government agencies, and private sector visual arts specialists continue to explore sustainable methods and formats for "born digital" records (as well as for CAD files or laser scans). However, the wide range of proprietary software and equipment makes it an impractical and costly proposition; the Library does not accept digital materials that are not produced using open-source software. Thus, while laser scans are vital to HABS field work, they are not used for formal documentation. Still to be reconciled is the fact that laser scanning, unlike hand-measuring, does not produce the field notes that HABS has always considered essential to the verification of the drawings and the source for more in-depth information. HABS/HAER/HALS does not use laser scanning for recording exclusively, but always combines its use with hand-measuring in order to attain comprehensive and well informed documentation. The scanned data taken of the elevations are combined with the hand-measured details and plans and then traced to delineate a hard line for the otherwise indistinct edges created by the point cloud data. Along with issues of the permanence of the data long-term, another reason the programs combine recording methods is that laser scanning does not engage the recorder in the same manner that hand-measuring does. Thus its use can undermine the hands-on experience advocated by HABS/HAER/HALS and others interested in the study and documentation of historic sites. Thorough field work and research are an important part of the process, aimed at providing not just a permanent record, but an approach to the study and understanding of historic buildings. While measuring, notes are made with regard to building materials and construction technology, and observations about changes in the fabric of the structure are recorded. This practice must be incorporated into the scanning process.